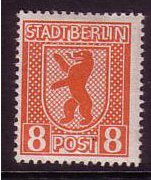 Germany 1945 Stadt Berlin set. SGRA1-SGRA7. 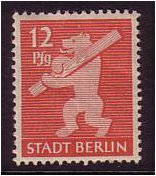 Mounted mint 1945 Stadt Berlin set. SGRA1-SGRA7. 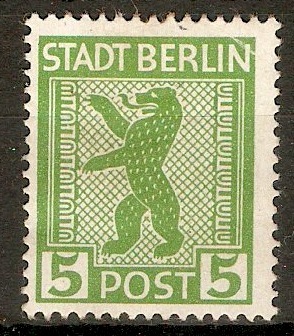 Russian Zone 1945 5pf Yellow-green. SGRA1. Heavy mounted mint 1945 5pf Yellow-green. SGRA1. 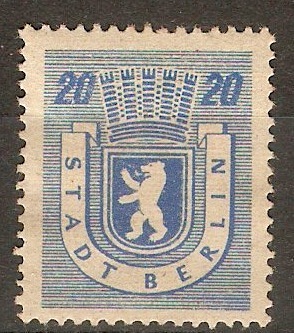 Germany 1945 6pf Stadt Berlin series. SGRA2. 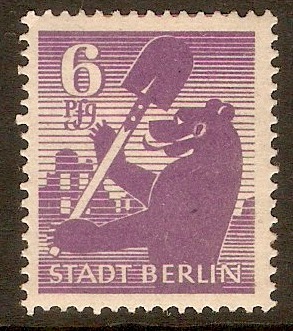 Mounted mint 1945 6pf Stadt Berlin series. SGRA2. Russian Zone 1945 6pf Violet West Saxony Imperf. SGRD2. Fine used 1945 6pf Violet West Saxony Imperf. SGRD2. Vertical pair. 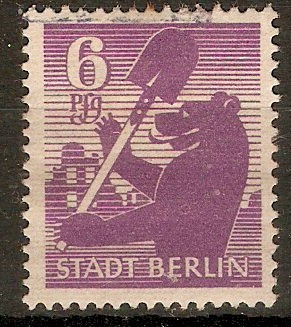 Russian Zone 1945 6pf Violet. SGRA2. Some damage 1945 6pf. Violet SG RA2. NOTE: Staining in top margin. Russian Zone 1945 8pf Red-orange. SGRA3. Lightly mounted mint 1945 8pf Red-orange. SGRA3. 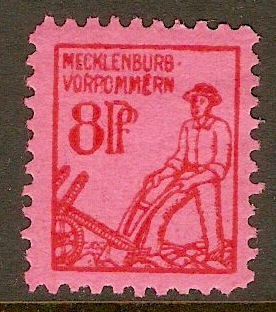 Germany 1945 8pf Red on red. SGRB4. Mounted mint 1945 8pf Red on red. SGRB4. Russian Zone 1945 10pf Brown. SGRA4. Mounted mint 1945 10pf Brown. SGRA4. Russian Zone 1945 12pf Carmine. SGRA5. Mounted mint 1945 12pf Carmine. SGRA5.